On receipt of order, and once your proofs are confirmed, your table plan will be prioritised, produced and dispatched within 7 working days. In order for us to fulfil this service to you we require your confirmed guest list and table layout on order, and a prompt response to the proofing process. This service is available on ALL TABLE PLANS. Simply add this service to your bag at checkout. The £50 Express fee is in addition to our standard delivery charges. Should you wish to add matching table stationery on the Express Service please can you call 01253 608950, join the Live Chat, or email support@weddingtableplans.com to check the order can be fulfilled within the 7 working day timeframe as it depends on production levels at the time of order. 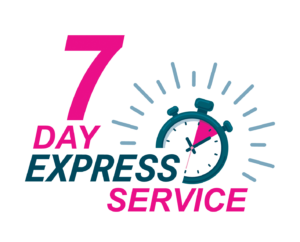 7 Day Express Service… giving you peace of mind.